Mr. and Mrs. William D. Beck have funded two Charitable Gift Annuities which will be used to create a professorship for Special Education in the College of Education. Their generosity reflects their desire to "give back" to LSU, which they feel has played a great role in the education and success of their family. 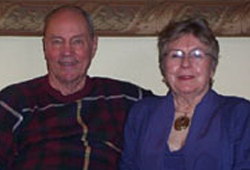 Fran and Bill Beck met during their college years at St. Louis University. After receiving their degrees, they moved to Louisiana so that Bill could gain employment in the oil industry. With a Masters in Education, Fran Beck went to work in Vermillion Parish, where she pioneered the Special Education program for the area. Bill's work as a Geophysicist for the oil industry kept him away from home often. After a few years of this, the couple decided they wanted to make a change to "control their destiny better". They planned to do this by going back to school. The Becks chose LSU because "it provided the opportunity for both of them to continue their education." Fran and Bill, along with their three small children, moved to Baton Rouge in the 1960's. Their fourth child was born shortly after their move. Fran pursued her PhD in Special Education while Bill attended the LSU Law Center. After receiving their LSU PhD and J.D., Bill began to practice law and Fran began teaching in East Baton Rouge Parish, as Supervisor. In 1965, Fran began her 27 year career with LSU, as the first woman to join the faculty of the College of Education. She also became the first woman to serve on the LSU Athletic Council. Fran is now a member and former president of the College of Education's Peabody Society. Together with their four children, the Beck family has received a total of seven LSU degrees. All of their four children attended LSU. Their oldest son graduated in Business at LSU, while their two daughters followed in their father's footsteps and each received a J.D. from the LSU Law Center. The Becks have designated their gift to benefit Special Education, not only because of Fran's education and career, but also because they believe "there is a great need for donations to the College of Education." The Becks' gift will touch many lives in the field of Education at LSU, just as Fran has for many years.